For those who are non-citizens, but legally live in the U.S. If you are here in the U.S. and considered a non-citizen, you should be on a work visa or applying for a green card. This means that you should be here in the U.S. more than 6 months out of the year. This timeframe is important as it shows U.S. based insurance carriers your desire to stay in the U.S. Generally speaking, the longer you have lived in the U.S., the easier it will be to apply for life insurance. Some temporary visas are eligible for life insurance including, but not limited, to E1-2, H1-B, H-4, K1-4 and more. Again, if you are on a visa or green card, or applying for such, and meet other requirements, you should be able to obtain life insurance. You will probably need additional information as described below. There are two main areas the insurance companies look at: the life expectancy of the country you live in and if the country you live in is on a black list by the U.S. or your own country. This is only the case if you are considered a citizen/full-time resident of these countries. If you are not, we may be able to secure life insurance. These two lists change and are not conclusive, so it is best to confirm with us if you think your country may not be eligible for U.S. based life insurance. The key of purchasing life insurance from a U.S.-based company is that you must be in the U.S. to do so – you must be in the U.S. for the application, medical exam, and policy delivery. You must have specific ties to the U.S. somehow, such as having business interests, married to a U.S. citizen, or having some type of financial interest. That means you can’t simply take a vacation to the U.S. and apply for life insurance. You must also remain in the U.S. for policy delivery. Apply and take the exam in the U.S. While this seems like a lot of work, if you understand the process, it is not. The process can definitely take some time, but that shouldn’t deter you if you have been considering U.S. based life insurance. The main points are: you need to physically be in the U.S. for application and delivery; bring your medical records (if approved to do so); and fill out the application and go through the underwriting. We can’t stress enough to be honest on the application. The life insurance process can be long enough for even U.S. citizens living here in the U.S. If something in your application does not match with information in your medical records, chances are your application will be delayed or declined altogether. 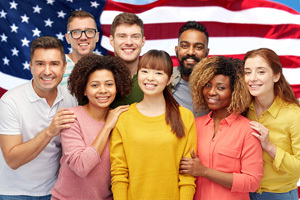 Types of insurance policies available to foreign nationals, non-residents, and visa/green card holders include term, whole life, and universal life policies. As we mentioned, permanent policies may be a good choice because of the stability of the U.S. insurance system. Permanent insurance can also be ideal for those foreign nationals facing estate or tax issues. U.S. based life insurance is free from estate tax, income tax, and possibly other transfer taxes. While we understand taxes, we are by no means a tax advisor, and we recommend you speak to a tax advisor regarding your situation. Are you a foreign national, non-resident, or green card/visa holder? If so, My Family Life Insurance can help secure life insurance for you.